The five Christians whose action blocked the Custom House entrance to the arms fair on 10th September have been found not guilty of aggravated trespass. 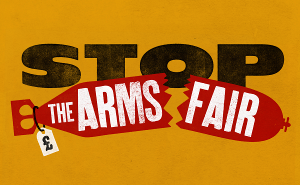 Christian protesters blocked the main visitors entrance for an hour on the opening day of the arms fair – one of many effective direct actions during the week. It was the video evidence supplied by the police for purposes of prosecution which helped the five win the case, ironically. They had not received clear instructions as to what to do when they left the Excel ground, it was decided. You can read more about the outcome of the trial here.